111 The 'old Hall' is said to have stood to the east at right angles to this building, and to have faced the south. There are considerable traces of foundations. In the old 'stay-at-home' days, we frequently find a son, on his marriage, building a new house close to his father's. 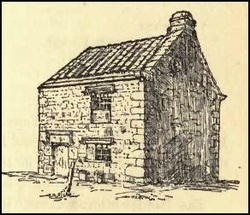 At EAST HEDDON, the remains of the ancient residence of a branch of the Fenwick family have been turned into granaries, hen-houses,and cattle-sheds. At the east end of this range there is on the groundfloor a huge kitchen fire-place, and above it one with Tudor details. The windows exhibit delicate mouldings of a later date. 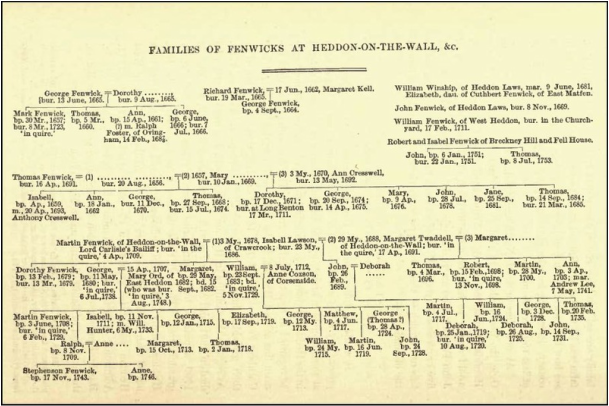 I give the pedigree of the Fenwicks of East Heddon, founded on the Heralds' Visitation A.D. 1615 and the Heddon Registers. It is evident there are great discrepancies in this pedigree, and it requires to be explained from title-deeds, wills, &c.
East Heddon afterwards came into the possession of the Corporation of Newcastle, and was by them sold to the Ridleys of Blagdon. were 'Martyn Fenwyke, Clement Rede, and Thomas Eede. Rychart Elwyk. Thomas Atkynson. Thomas Bartley. Mhomas Trumwell. Robert Sclatter. Willm Myddylton. Ric. Sclatter. Willm Hill. Able with hors and harnes." "Dorthy Hill, daughter to Henry, of heddon on ye wall, was baptised feb.ye 16th;" "Sara Bertley was baptized by Mr. Dockrey, mnistr., of Newburn, ye 14th of May, 1656." bushell of rye. To Gerard Sanderson, one of my best Lambes, and if he dye to be delivered to his father. * * * To James Hobson 1 boll of rye." " Mr. Martyne ffenwick, George fennick, Edward Criswell, Xpfer richardson, Robert Hill, Richard Browne, James Hobson, vicar, Thomas Softlye, George raimes, &c."
show how wide the ramifications of farming were in those days, owing to a complicated system of land tenure. Ann Barkas by her will, A.D. 1585, desired to be buried in Heddon Churchyard. She left her property among her children, George Barkas, Jeffrey Barkas, Anne Barkas, and Elizabeth Grenooe, and appointed as their respective guardians, her brother William Mydleton, her brother-in-law Symon Ladleye, William Hill, and Elizabeth Grenooe's father (sic) Steven Grenooe. The witnesses were William Mydelton, Symond Ladleye, Steven Grenooe, Edward Stocco, and James Hobson. The inventory was taken by Edward Cresswell, Edward Stoccoe, Matthew Foster, and Jeffrey Barkas. The will of Anne Cresswell of Heddon-on-the-Wall, 2 March, 1614, directs her body to be buried in Heddon Church, and mentions her sons Anthony, Clement, and Arthur, her daughter Margaret Barkas, Isabell  her son's wife, William Barkas, her son Clement's daughter Mabell Barkas, and her son Arthur's daughter Mabell. county, descending from knights and squires to yeomen, and, probably, at last to mere labourers. Fyve hundrid Fennicks in a flock." 1709, appear to have been thrice married ; the latter had twenty grandchildren. That all these families were branches of the East Heddon family is, I take it, sufficiently proved by their having been buried with them ' in the quire;' only a William Fenwick of West Heddon was buried outside in the churchyard on 17 Feb., 1711. Additional evidence of consanguinity is afforded by the fact of Mr.Martin Fenwick of East Heddon having stood godfather to Martin, the sixth son of Bailiff Martin, on 28 May, 1700. 112 Leges Marchiarum, pp. 280-1. 113 On the 30th Oct., 1569, the Inq. post mortem of Anthony, second son of William Swinburne, of Capheaton, was held at Heddon-on-the-Wall. Hodg. Nortlid., II., i,, p. 232. 114 Other early surnames occurring in the Registers are Collin, Peascod, and Archer. 115 In the Survey of Crown Lands in Northumberland, about 1608, preserved at the Land Revenue Record Office, Marmaduke Fenwick appears as ' an ancient freeholder' of lands at Ovington, late in the tenure of William Carr. 116 The will of a William Middleton, of Heddon, dated 31st March, 1578, is among the Enrolments at Durham. 117 Arthur Cresswell. bur. 18th Sept., 1674. Hed. Reg. 118 The fact that ' Isabell Cresswell, wiffe to Arthure Cresswell, depted. October ye 28th, 1671, buryed in Hedon upon ye Wall Church,' appears no less than three times in the Registers, once (as above) in the clerk's book, again in Latin in the vicar's small private book, and lastly (with the addition 'de Walbottell') as the first entry in the more orderly Register commenced in that year. 119 The will of Thomas Cresswell, of Heddon, proved 1621, is also at Durham. 120 MSS. Thos. Bates. My father had intended writing an account of various places and families in Northumberland, but unfortunately left few notes towards it. I made, however, memoranda of many of his recollections. C. J. B. 121 Ballad of the Redeswire Raid. Legendary Ballads of England and Scotland (Chandos Classics), p. 144.